Another difference lies in the staff, who were all very helpful and radiated good vibes. It was noticed by our team. Well done! Especially since Hemingways has only been open around three months. This short time of operation shows in the menu, which should be thought of as a ‘work in progress’ as menu items are driven by customer choices. The layout includes an alcove area on your left as you come in, and another smaller one on the right. Keep going gets you to the long oval bar, centrally placed. There is also one wall dedicated to craft beers, which seems to be all the go at present. Going on there is a dais for live bands and then a sporting viewers, and there is another comfy place for chatting/eating, and it doesn’t stop there. An outside (but covered) area for a standing chat for socializers as well. Take your pick! The (in a state of flux) menu is interesting starting with breakfasts (for a venue not opening till 11.30)! Never mind, let’s deal with the specials first. These change daily with a steak dish Mondays (B. 395), and on to pizza and a pint Tuesday (B. 290), a curry night Wednesday (B. 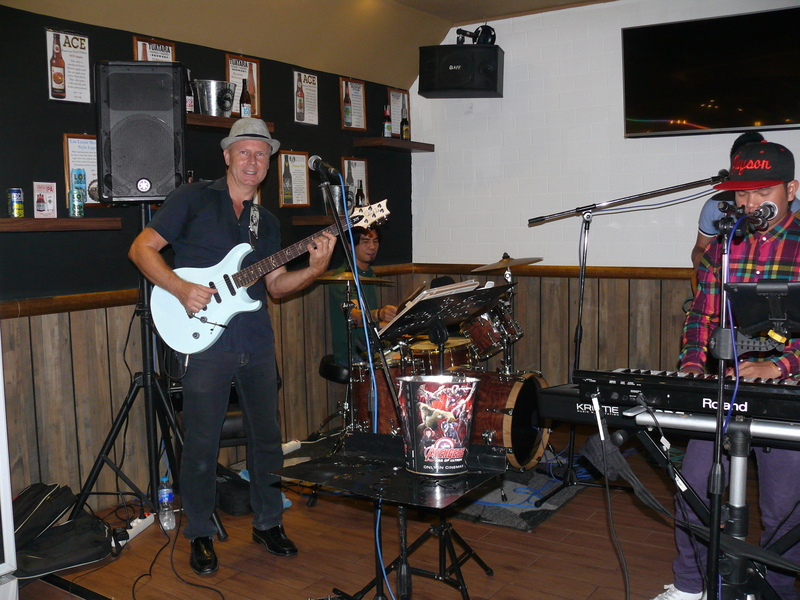 200 and up), Thursdays are live music, currently Helmut and Friends, Friday not settled on yet and then roasts at the weekends (B. 250-335). So to the multi page menu which begins with bar snacks (B. 150-210) and several soups (B. 90-135). Sandwiches are B. 145-170 and jacket potatoes B. 130-180. There’s a range of salads (B. 230-245) then a page of pizzas (B. 170-230). Mains are typical pub fare with fish and chips B. 325 and half a chicken B. 275 for example. Char grills range between B. 220 for the beef burgers and B. 495 for rib eye. A separate menu for kids (this is a family pub) (B. 120-160), and Thai favorites (B. 140-225) and Indian flavor curries B. 140-180. 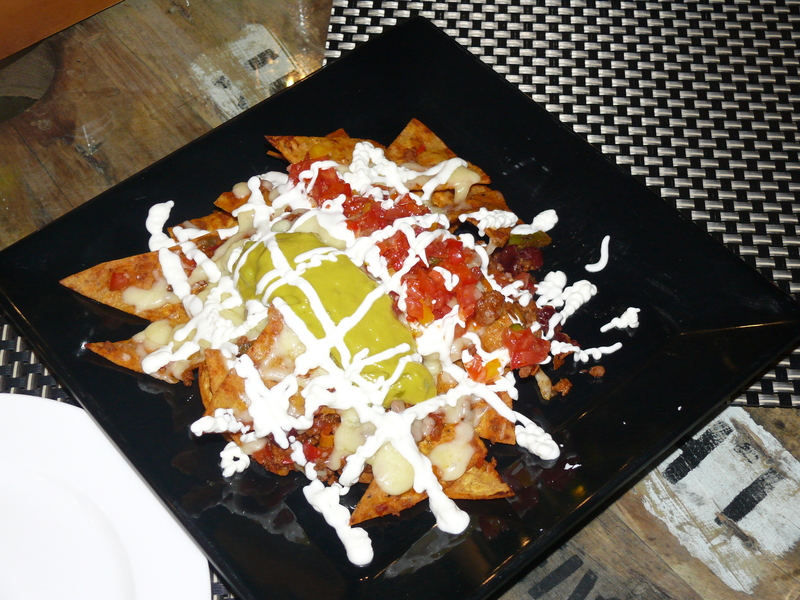 We had a plate of assorted nachos to begin, which was almost a meal on its own, and followed that up with a cod and chips for Madame and a beef burger for me. Both these dishes came with appropriate trimmings and were again large portions. Neither of us could finish the plate. 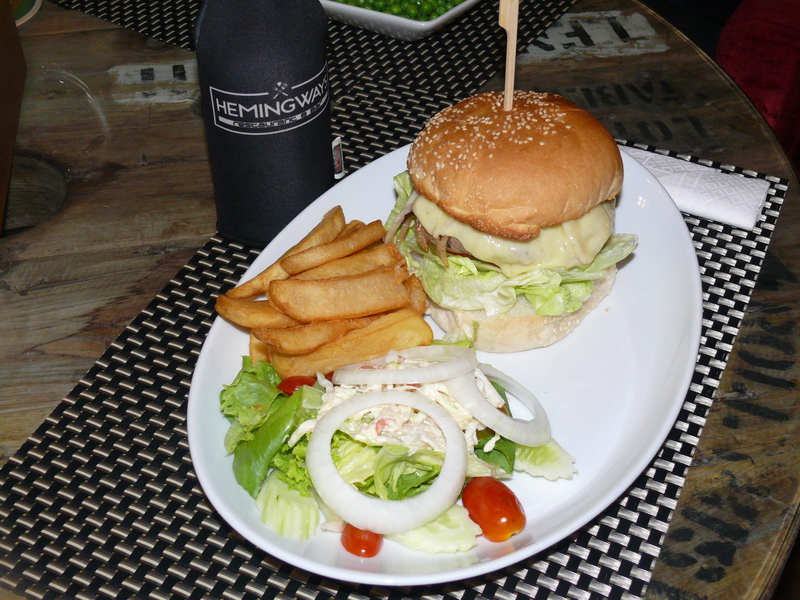 We can certainly suggest to you that Hemingways is very well worth your popping in for a pint or a meal. So where is it exactly? Come down Thappraya Road and turn right towards Dongtan Beach at the traffic lights, and Hemingways is on your right before the archway. And the significance in the name? None, apparently, it just had a nice ring to it, but there is one back wall with a tribute to the great novelist. However, his demise is not mirrored in this restaurant which uses his name, in fact we believe that Hemingways has all the hallmarks of success. Do try. 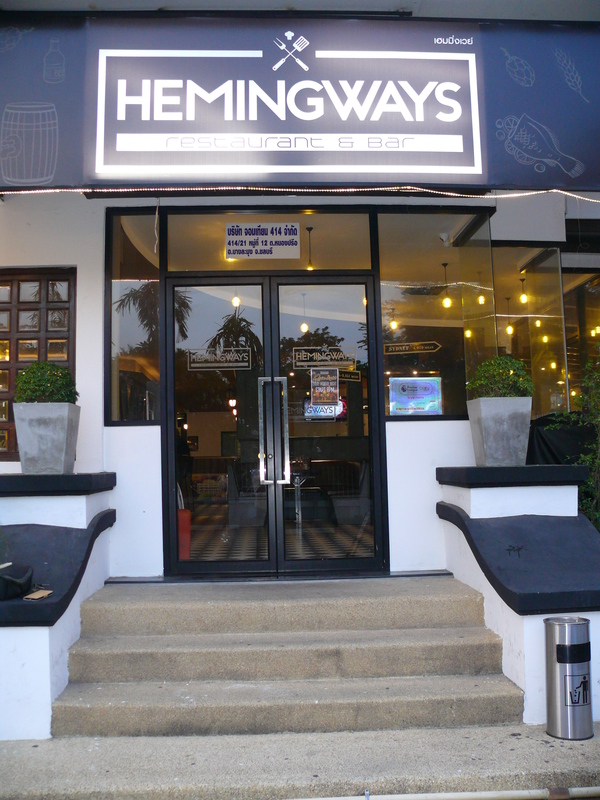 Hemingways Jomtien, 472/79-80 Thappraya Rd, Jomtien, tel. 094 010 5687, parking inside the compound, open 11.30 a.m. until 11.30 p.m.